Has support for standardization efforts like BACnet and Project Haystack naming/tagging taxonomy grown to the point that it is providing a pathway for data-driven building operations technologies across the Chasm? It feels like our industry is moving into a higher gear. So to think through the shifting momentum, I took out my Crossing the Chasm Colorforms and started to hypothesize about where the market for software and services supporting data-driven commercial building operations —a.k.a. 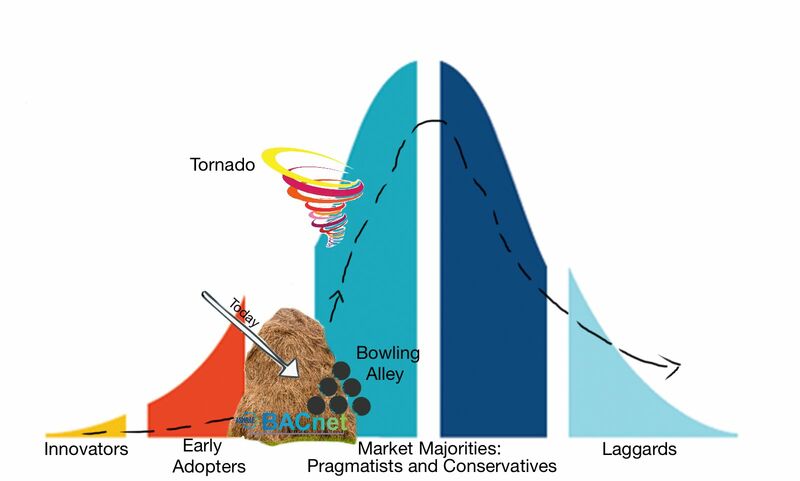 the Building Internet of Things or B-IoT — is on the Chasm adoption curve. Good evidence that building operation analytics has made it to the much-safer “Bowling Alley” side of the divide is that customers are demanding and our industry is delivering “Whole Products.” Moore defines a “ Whole Product” as “all the complementary software applications, devices and services needed to fill out a core product to deliver compelling value to ‘Main Street.” The article this month from Alper Uzmezier of BASSG details all the products and services that the SkySpark™ Ecosystem is delivering to make it more turn-key for system integrators to deploy an analytics solution for their customers. Likewise, the article from Greg Shank of Altura Associates presents why the combination of commissioning services plus analytics is remaking the entire design/construction cycle and setting the stage — ie, defining the software platform for — ongoing energy management and commissioning. ‘Chasm-speak’ uses the term Bowling Alley to convey the thought that technological innovations like this take hold market segment by market segment. It will take strong ecosystems of value-add software and service providers to deliver whole products at the right price/performance points for all the building types and geographies that comprise the existing built environment. For this reason, our industry could spend a long time in all the potential lanes of our Bowling Alley. My Chasm thinking was also informed by a Memoori podcast this month featuring Project Haystack participants Marc Petock and John Petze, moderated by James McHale. Here too, I learned that Fortune 50 companies are expressing high interest in Haystack. Does it get more Mainstreet than that? So I followed up with Marc and John, asking their thoughts about where the industry is on the Chasm curve. Marc Petock largely concurred that the basic building block technologies for the Buildings IoT are across the Chasm. 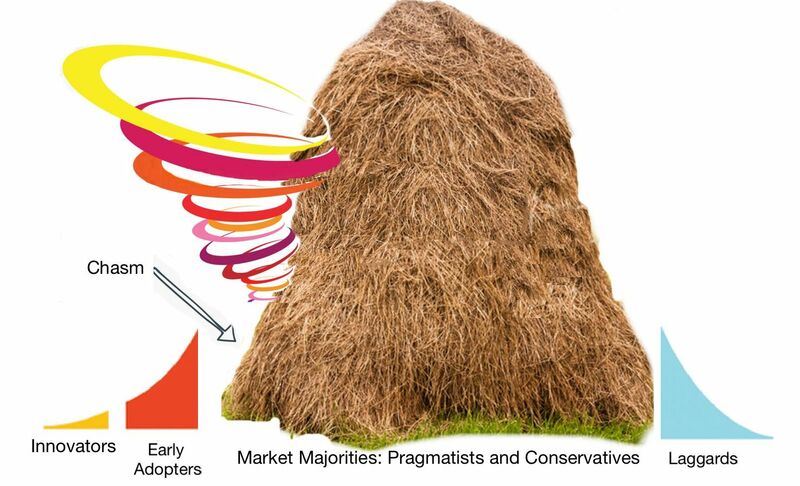 He added, “Haystack is radical new thinking about data. This change must begin at the most basic levels, with new conceptions about how devices, information, people and systems interact. I believe that Haystack is delivering business relevant outcomes that are driving new value in a built environment. Common protocols and naming are securing the interoperability of related connected systems, devices and things. They are making the data contained within them self-describing and enabling seamless integration across multiple applications to improve operations, reduce costs and maximize occupant experiences. Value from data will only be realized if organizations can understand and leverage the data they produce. By creating value from the data generated, companies can improve operations, reduce costs, and enable valuable customer experiences. I’ve found the Chasm terms and explanations ring fairly true for understanding the dynamics of why, how and when technology markets transform. Maybe because Moore makes such great use of the bell curve. (ha ha) What do you think? Write me at therese@buildingcontext.me.